Time to chuck out the keyboard and mouse? A keyboard and a mouse has been a standard feature for most computers, however tech start-up 'Gest' wants to make computer interactivity a lot better. 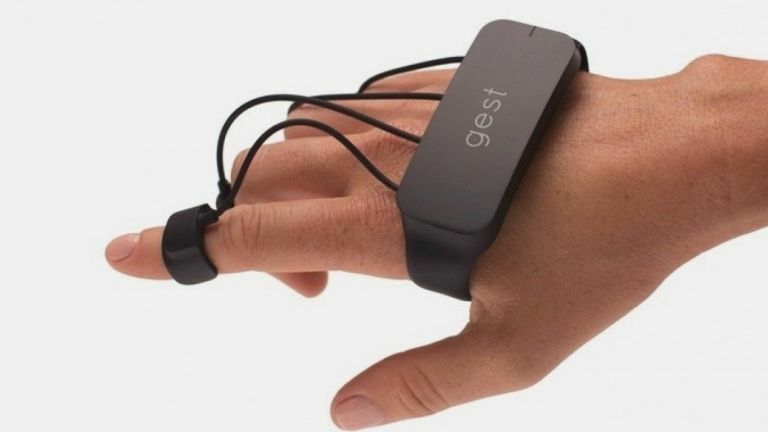 Gest is a strap that you can attach to your hand and fingers that will supposedly replace the tapping, swiping and clicking you're used to on your home computer, tablet or smartphone. The device uses accelerometers, gyroscopes, and magnetometers to determine the position of your fingers on the screen. A major question being raised with this product is whether it will have the accuracy to type without you tearing out your hair with frustration when Gest thinks your pressing a different key. According to Gest developers it's “precise accuracy has a lot of potential”. Once the device is up and running it will connect to your device via Bluetooth. It will also possess LED lights that will indicate when Gest is running low on battery. Initially designed for graphic designers using Photoshop, they'll be able to grab, pull and re-size photos and text all via the Gest glove which all sounds great, but the company also hopes to tap into the virtual reality market. When two controllers are connected you'll be able to become a typing whizz as they'll completely replace your classic keyboard. Although still in a development stage, this device has a huge potential in bringing to the market a fresh way of interacting with our daily tech. For $149 you can pledge for the early-bird release of Gest on Kickstarter. Shipping is expected for November next year.